Bluechocolate Diaries: Home sick in more ways than one! I'm Home Sick, as if you couldn't tell. Actually I'm also at home, sick, my Two year old had a 103° temp at 6am, fortunately I've been able to bring in down. She's currently gluing shapes on paper and making a big happy mess as she is doing her craft for the day, Oh to be 2 again and have no worries.Now me, I feel like my throat is filled with sand and in general like crap. And when I feel like crap I want to go home. 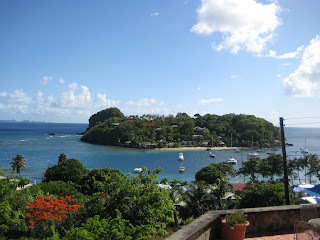 So here are my gratuitous pictures of SVG (Saint Vincent and The Grenadines) . For those who don't know I grew up on a tiny island in the Caribbean, and though I was born in the US I still consider myself vincentian, though I also consider myself American. Well Heck it's my prerogative, I'm both. The picture on the left was taken from my Aunt Suzanne's veranda, the island is Young Island , its actually a hotel. 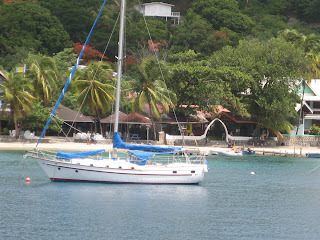 And the picture below was taken entering Port Elizabeth, on the island of Bequia, ( my favorite place to go for the weekend) . I just want to sit on a porch and read a book. Okay enough wallowing in self pity I'm off to put Alex down for a nap and write. Oh and Happy anniversary To Kevin and Yamilca, and Melissa and Damian. Five years Woo Whoo! There I was happy for a whole minute, just kidding. I'm homesick too, have to stop myself from looking at all my lovely summer pics or I'll be in tears! I'm never homesick for Texas -- where I grew up, but I'm frequently homesick for Arizona-- where I went to college (my soul's home). And I have a sandpaper throat and a stuffy nose, etc., too, so I totally understand.